Summaries of the evening discourses by S.N. Goenka from a ten-day course of Vipassana. 'Liberation can be gained only by practice, never by mere discussion', S.N. Goenka has said. A course in Vipassana meditation is an opportunity to take concrete steps towards liberation. For this reason, in a Vipassana course the emphasis is always on actual practice. No philosophical debates are permitted, no theoretical arguments, no questions that are unrelated to one's own experience. As far as possible, meditators are encouraged to find the answers to their questions within themselves. The teacher provides whatever guidance is needed in the practice, but it is up to each person to implement these guidelines: one has to fight one's own battle, work out one's own salvation. Given this emphasis, still some explanation is necessary to provide a context for the practice. Therefore every evening of a course Goenkaji gives a 'Dhamma talk', in order to put into perspective the experiences of that day, and to clarify various aspects of the technique. These discourses, he warns, are not intended as intellectual or emotional entertainment. Their purpose is simply to help meditators understand what to do and why, so that they will work in the proper way and will achieve the proper results. It is these talks that are presented here in condensed form. 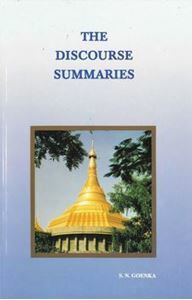 The eleven discourses provide a broad overview of the teaching of the Buddha. The approach to this subject, however, is not scholarly or analytical. Instead the teaching is presented in the way that it unfolds to a meditator: as a dynamic, coherent whole. All its different facets are seen to reveal an underlying unity: the experience of meditation. This experience is the inner fire that gives true life and brilliance to the jewel of the Dhamma.